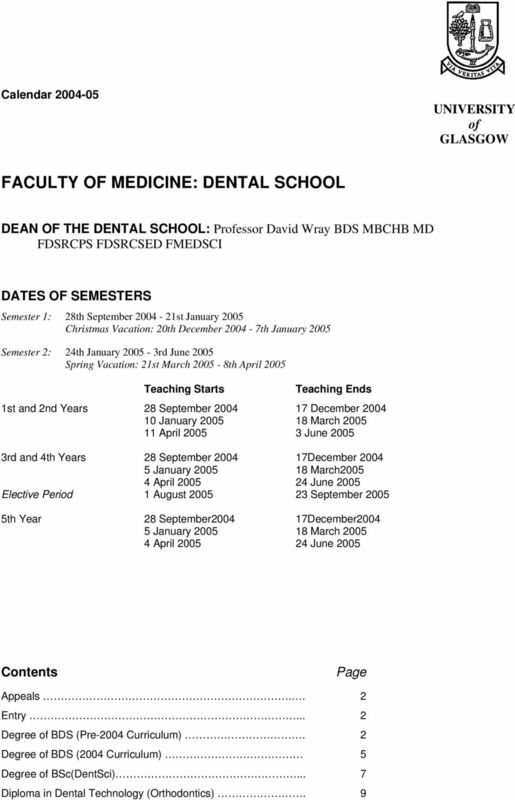 Download "FACULTY OF MEDICINE: DENTAL SCHOOL"
2 Den.2 Degree of BDS (Pre-2004 Curriculum) I APPEALS BY STUDENTS The Senate is charged by the Universities (Scotland) Acts with a duty to superintend the teaching of the University. This is understood to include examining. The Senate has authorised the establishment of Faculty Appeals Committees to hear appeals in the first instance, as specified in the Code of Procedure for Appeals to a Faculty Appeals Committee. A student may further appeal from the decision of the relevant Faculty Appeals Committee to the Senate. Any appeal giving all the grounds of that appeal must be despatched in writing to the Faculty Secretary of the relevant Faculty, or to the Clerk of Senate, as appropriate, within 14 days of the intimation to the student of the decision against which he or she is appealing. Students are advised to consult the Faculty Academic Administrator before lodging an appeal to the Faculty Appeals Committee and the Head of the Senate Office, before lodging an appeal to the Senate Appeals Committee. The Code of Procedure for Appeals to a Faculty Appeals Committee and the Code of Procedure for Appeals to the Senate are set out in that section of the University Calendar entitled University Fees and General Information for Students, which is available either from the Faculty Office or The Registry enquiry office in the University. The address of the Faculty Academic Administrator is The Wolfson Medical School Building, University of Glasgow, University Avenue, Glasgow G12 8QQ. II UNDERGRADUATE ENTRY Before applying for admission to the Faculty of Medicine, all applicants should consult the most recent edition of the University s Undergraduate Prospectus. The Prospectus sets out the normal qualifications required for admission, describes the application procedure, summarises the degree regulations and courses offered, and gives general information about the University. It is available in most U.K. schools, or it may be obtained from The Student Recruitment and Admissions Service, University of Glasgow, Glasgow G12 8QQ. Information regarding the higher degree of Doctor of Dental Surgery (DDS) is given in the Graduate Studies section of the University Calendar. III DEGREE OF BACHELOR OF DENTAL SURGERY (PRE-2004 CURRICULUM) Regulations for the Degree of Bachelor of Dental Surgery came into force in The relevant provisions are as follows: 1. 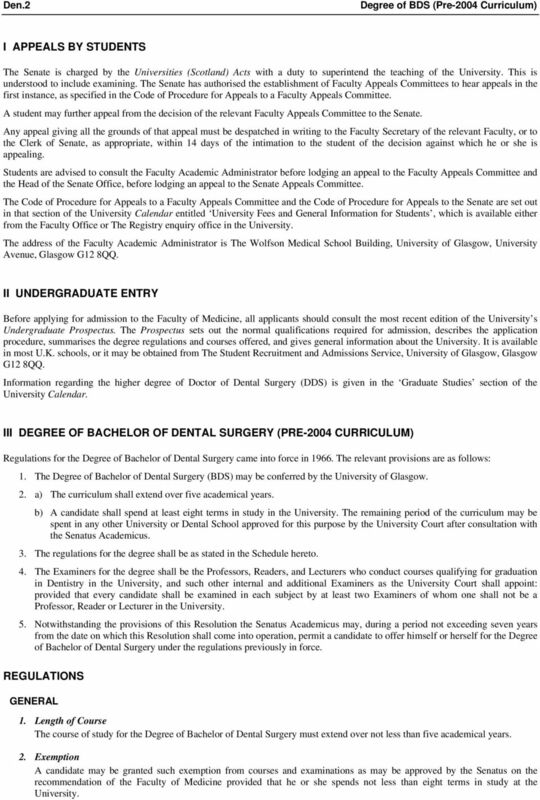 The Degree of Bachelor of Dental Surgery (BDS) may be conferred by the University of Glasgow. 2. a) The curriculum shall extend over five academical years. b) A candidate shall spend at least eight terms in study in the University. The remaining period of the curriculum may be spent in any other University or Dental School approved for this purpose by the University Court after consultation with the Senatus Academicus. 3. The regulations for the degree shall be as stated in the Schedule hereto. 4. The Examiners for the degree shall be the Professors, Readers, and Lecturers who conduct courses qualifying for graduation in Dentistry in the University, and such other internal and additional Examiners as the University Court shall appoint: provided that every candidate shall be examined in each subject by at least two Examiners of whom one shall not be a Professor, Reader or Lecturer in the University. 5. Notwithstanding the provisions of this Resolution the Senatus Academicus may, during a period not exceeding seven years from the date on which this Resolution shall come into operation, permit a candidate to offer himself or herself for the Degree of Bachelor of Dental Surgery under the regulations previously in force. REGULATIONS GENERAL 1. Length of Course The course of study for the Degree of Bachelor of Dental Surgery must extend over not less than five academical years. 2. Exemption A candidate may be granted such exemption from courses and examinations as may be approved by the Senatus on the recommendation of the Faculty of Medicine provided that he or she spends not less than eight terms in study at the University. 4 Den.4 Degree of BDS (Pre-2004 Curriculum) October/November: Second diet of examination 5. Progress A candidate may not proceed to any stage of the curriculum until he or she has successfully completed, or has been granted exemption from, the preceding courses. The criteria for successful completion of a course shall be set out in the relevant course information handbook and shall normally include: Satisfactory attendance and compliance with course instructions. Satisfactory completion of coursework. 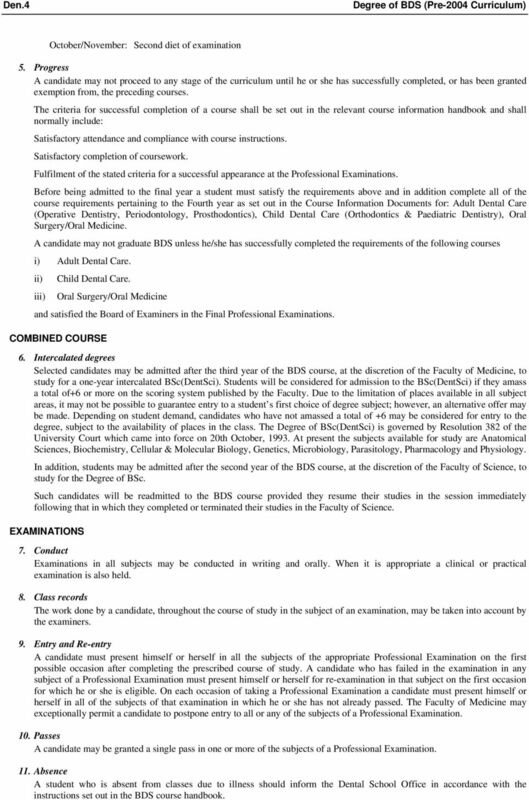 Fulfilment of the stated criteria for a successful appearance at the Professional Examinations. Before being admitted to the final year a student must satisfy the requirements above and in addition complete all of the course requirements pertaining to the Fourth year as set out in the Course Information Documents for: Adult Dental Care (Operative Dentistry, Periodontology, Prosthodontics), Child Dental Care (Orthodontics & Paediatric Dentistry), Oral Surgery/Oral Medicine. A candidate may not graduate BDS unless he/she has successfully completed the requirements of the following courses i) Adult Dental Care. ii) iii) Child Dental Care. Oral Surgery/Oral Medicine and satisfied the Board of Examiners in the Final Professional Examinations. COMBINED COURSE 6. Intercalated degrees Selected candidates may be admitted after the third year of the BDS course, at the discretion of the Faculty of Medicine, to study for a one-year intercalated BSc(DentSci). Students will be considered for admission to the BSc(DentSci) if they amass a total of+6 or more on the scoring system published by the Faculty. Due to the limitation of places available in all subject areas, it may not be possible to guarantee entry to a student s first choice of degree subject; however, an alternative offer may be made. Depending on student demand, candidates who have not amassed a total of +6 may be considered for entry to the degree, subject to the availability of places in the class. The Degree of BSc(DentSci) is governed by Resolution 382 of the University Court which came into force on 20th October, At present the subjects available for study are Anatomical Sciences, Biochemistry, Cellular & Molecular Biology, Genetics, Microbiology, Parasitology, Pharmacology and Physiology. In addition, students may be admitted after the second year of the BDS course, at the discretion of the Faculty of Science, to study for the Degree of BSc. Such candidates will be readmitted to the BDS course provided they resume their studies in the session immediately following that in which they completed or terminated their studies in the Faculty of Science. EXAMINATIONS 7. Conduct Examinations in all subjects may be conducted in writing and orally. When it is appropriate a clinical or practical examination is also held. 8. Class records The work done by a candidate, throughout the course of study in the subject of an examination, may be taken into account by the examiners. 9. Entry and Re-entry A candidate must present himself or herself in all the subjects of the appropriate Professional Examination on the first possible occasion after completing the prescribed course of study. A candidate who has failed in the examination in any subject of a Professional Examination must present himself or herself for re-examination in that subject on the first occasion for which he or she is eligible. On each occasion of taking a Professional Examination a candidate must present himself or herself in all of the subjects of that examination in which he or she has not already passed. The Faculty of Medicine may exceptionally permit a candidate to postpone entry to all or any of the subjects of a Professional Examination. 10. Passes A candidate may be granted a single pass in one or more of the subjects of a Professional Examination. 11. Absence A student who is absent from classes due to illness should inform the Dental School Office in accordance with the instructions set out in the BDS course handbook. 6 Den.6 Degree of BDS (2004 Curriculum) before the date on which this Resolution comes into force to offer himself or herself for the Degree under the regulations previously in force provided that, except by dispensation of Senate, no such permission will be granted after 7 years from that date. Regulations 1. Duration of Degree Study a) The programme for the degree shall normally extend over no fewer than five and not more than seven academical years of full-time study. b) The maximum duration of study indicated above is not inclusive of intercalating degrees. 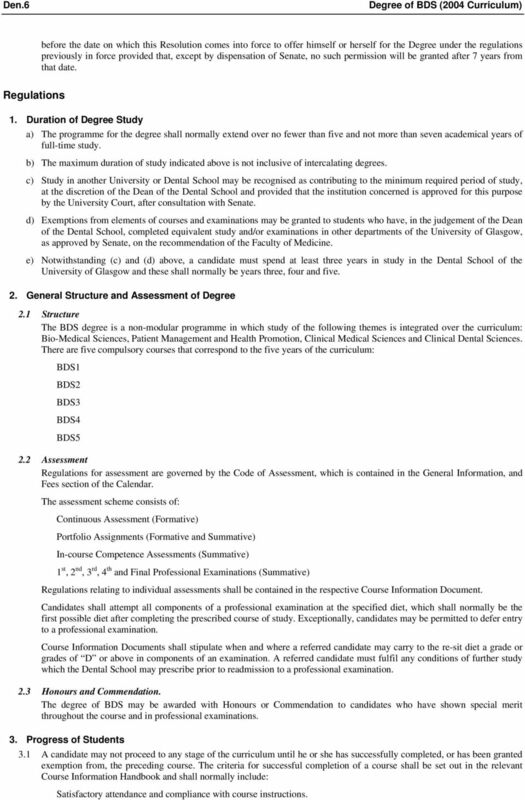 c) Study in another University or Dental School may be recognised as contributing to the minimum required period of study, at the discretion of the Dean of the Dental School and provided that the institution concerned is approved for this purpose by the University Court, after consultation with Senate. 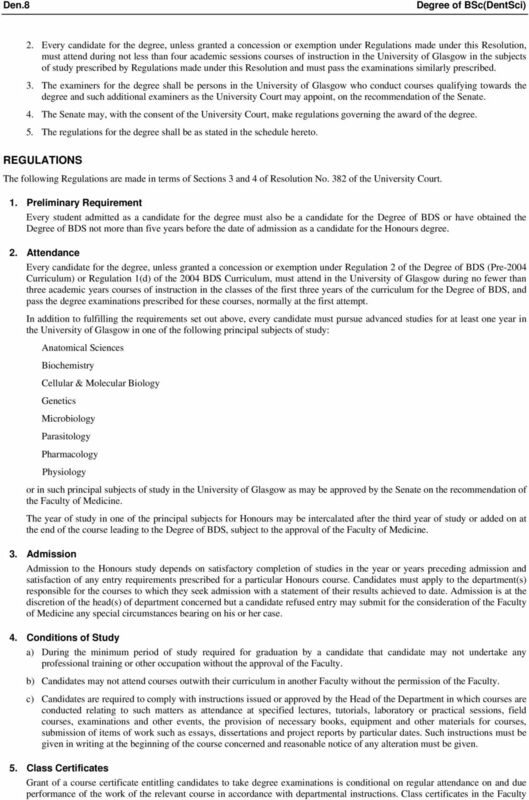 d) Exemptions from elements of courses and examinations may be granted to students who have, in the judgement of the Dean of the Dental School, completed equivalent study and/or examinations in other departments of the University of Glasgow, as approved by Senate, on the recommendation of the Faculty of Medicine. e) Notwithstanding (c) and (d) above, a candidate must spend at least three years in study in the Dental School of the University of Glasgow and these shall normally be years three, four and five. 2. General Structure and Assessment of Degree 2.1 Structure The BDS degree is a non-modular programme in which study of the following themes is integrated over the curriculum: Bio-Medical Sciences, Patient Management and Health Promotion, Clinical Medical Sciences and Clinical Dental Sciences. There are five compulsory courses that correspond to the five years of the curriculum: BDS1 BDS2 BDS3 BDS4 BDS5 2.2 Assessment Regulations for assessment are governed by the Code of Assessment, which is contained in the General Information, and Fees section of the Calendar. The assessment scheme consists of: Continuous Assessment (Formative) Portfolio Assignments (Formative and Summative) In-course Competence Assessments (Summative) 1 st, 2 nd, 3 rd, 4 th and Final Professional Examinations (Summative) Regulations relating to individual assessments shall be contained in the respective Course Information Document. Candidates shall attempt all components of a professional examination at the specified diet, which shall normally be the first possible diet after completing the prescribed course of study. Exceptionally, candidates may be permitted to defer entry to a professional examination. Course Information Documents shall stipulate when and where a referred candidate may carry to the re-sit diet a grade or grades of D or above in components of an examination. A referred candidate must fulfil any conditions of further study which the Dental School may prescribe prior to readmission to a professional examination. 2.3 Honours and Commendation. The degree of BDS may be awarded with Honours or Commendation to candidates who have shown special merit throughout the course and in professional examinations. 3. Progress of Students 3.1 A candidate may not proceed to any stage of the curriculum until he or she has successfully completed, or has been granted exemption from, the preceding course. The criteria for successful completion of a course shall be set out in the relevant Course Information Handbook and shall normally include: Satisfactory attendance and compliance with course instructions. 7 Degree of BSc(DentSci) Den.7 Satisfactory completion of portfolio assignments. Satisfactory mentors report. The attainment of competence in relation to designated learning outcomes. Fulfillment of the stated criteria for a successful appearance at the professional examination. A candidate may not graduate BDS unless he/she has successfully completed the BDS5 course and satisfied the Board of Examiners in the Final Professional Examination. Every candidate must normally have obtained the Certificate of Basic IT Competence in his or her first session in order to progress to subsequent sessions of study and to qualify for any award covered by these regulations. 3.2 A candidate whose attendance, conduct or progress is considered to be unsatisfactory may be excluded from further instruction and examination for the degree of BDS. A candidate shall normally be excluded: a) If he or she fails to pass the 1 st, 2 nd, or 3 rd professional examination after two attempts. b) If he or she will be unable to fulfill the requirements of the BDS5 course, as set out in the Course Information Document, before the end of his or her 6 th session in the study of Dentistry. The Faculty of Medicine Progress Committee shall have the authority to rule on issues of progress, including the authority to set aside the regulations governing exclusion and to permit a student to repeat a year of the course. Students may appeal against decisions of the Progress Committee to the Faculty of Medicine Appeals Committee. 3.3 Students who have temporarily withdrawn from the BDS programme on medical or other grounds may be readmitted to study at the discretion of the Dean of the Dental School. Where readmission is permitted the Dean shall determine, on advice, the appropriate point for re-entry and the conditions of study which shall apply. 4. Absence, Elective Study, Overseas Study, Intercalated Degrees. 4.1 Absence Attendance at clinical placements is compulsory. Students absent through illness must comply with the Student Absence Regulations (Registry). Requests for leave of absence for other reasons should be submitted to the Associate Dean for Dental Education in writing at least three weeks in advance. 4.2 Elective Study All students must complete an elective study project; the reporting of which shall be included as a portfolio assignment. Protocols must be approved by an elective supervisor prior to the study period. Where the elective project involves a period of study outwith Glasgow, an appropriate local supervisor must be chosen and approved by the Convener of the Electives Committee. The student must produce written evidence of satisfactory attendance and work during the elective period spent away from the Dental School. 4.3 Study Overseas Candidates for the degree of BDS are permitted to study overseas within the provisions of the Socrates agreement or other student exchange schemes approved by the University Court on the recommendation of Senate. 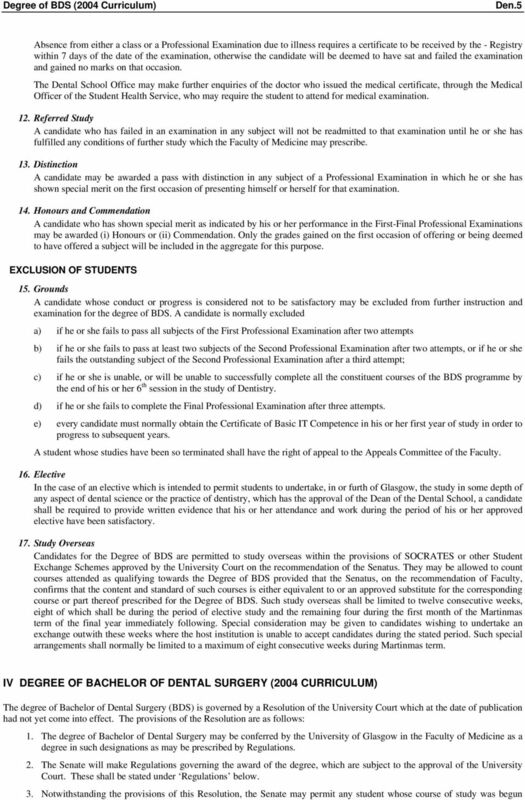 They may be allowed to count courses attended as qualifying towards the degree of BDS provided that Senate, on the recommendation of Faculty, confirms that the content and standard of such courses is either equivalent to, or an approved substitute for, the corresponding course or part thereof prescribed for the Degree of BDS. Such study overseas shall be limited to twelve consecutive weeks, the first eight of which shall be during the elective period. Special consideration may be given to candidates wishing to participate in an exchange outwith these weeks. 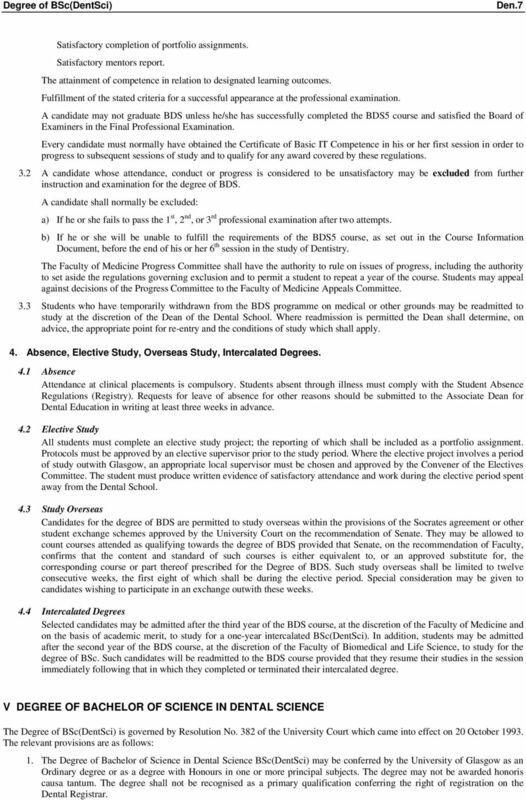 4.4 Intercalated Degrees Selected candidates may be admitted after the third year of the BDS course, at the discretion of the Faculty of Medicine and on the basis of academic merit, to study for a one-year intercalated BSc(DentSci). In addition, students may be admitted after the second year of the BDS course, at the discretion of the Faculty of Biomedical and Life Science, to study for the degree of BSc. Such candidates will be readmitted to the BDS course provided that they resume their studies in the session immediately following that in which they completed or terminated their intercalated degree. V DEGREE OF BACHELOR OF SCIENCE IN DENTAL SCIENCE The Degree of BSc(DentSci) is governed by Resolution No. 382 of the University Court which came into effect on 20 October The relevant provisions are as follows: 1. The Degree of Bachelor of Science in Dental Science BSc(DentSci) may be conferred by the University of Glasgow as an Ordinary degree or as a degree with Honours in one or more principal subjects. The degree may not be awarded honoris causa tantum. The degree shall not be recognised as a primary qualification conferring the right of registration on the Dental Registrar. 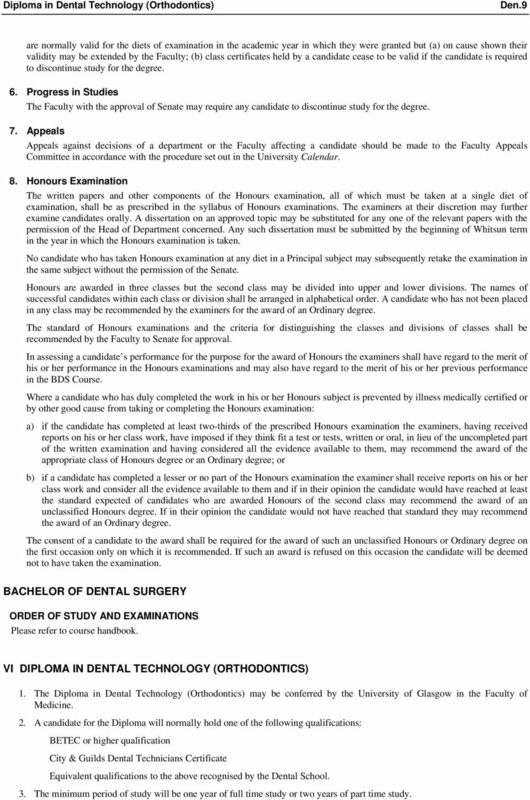 9 Diploma in Dental Technology (Orthodontics) Den.9 are normally valid for the diets of examination in the academic year in which they were granted but (a) on cause shown their validity may be extended by the Faculty; (b) class certificates held by a candidate cease to be valid if the candidate is required to discontinue study for the degree. 6. Progress in Studies The Faculty with the approval of Senate may require any candidate to discontinue study for the degree. 7. Appeals Appeals against decisions of a department or the Faculty affecting a candidate should be made to the Faculty Appeals Committee in accordance with the procedure set out in the University Calendar. 8. Honours Examination The written papers and other components of the Honours examination, all of which must be taken at a single diet of examination, shall be as prescribed in the syllabus of Honours examinations. The examiners at their discretion may further examine candidates orally. A dissertation on an approved topic may be substituted for any one of the relevant papers with the permission of the Head of Department concerned. Any such dissertation must be submitted by the beginning of Whitsun term in the year in which the Honours examination is taken. No candidate who has taken Honours examination at any diet in a Principal subject may subsequently retake the examination in the same subject without the permission of the Senate. Honours are awarded in three classes but the second class may be divided into upper and lower divisions. The names of successful candidates within each class or division shall be arranged in alphabetical order. A candidate who has not been placed in any class may be recommended by the examiners for the award of an Ordinary degree. The standard of Honours examinations and the criteria for distinguishing the classes and divisions of classes shall be recommended by the Faculty to Senate for approval. In assessing a candidate s performance for the purpose for the award of Honours the examiners shall have regard to the merit of his or her performance in the Honours examinations and may also have regard to the merit of his or her previous performance in the BDS Course. Where a candidate who has duly completed the work in his or her Honours subject is prevented by illness medically certified or by other good cause from taking or completing the Honours examination: a) if the candidate has completed at least two-thirds of the prescribed Honours examination the examiners, having received reports on his or her class work, have imposed if they think fit a test or tests, written or oral, in lieu of the uncompleted part of the written examination and having considered all the evidence available to them, may recommend the award of the appropriate class of Honours degree or an Ordinary degree; or b) if a candidate has completed a lesser or no part of the Honours examination the examiner shall receive reports on his or her class work and consider all the evidence available to them and if in their opinion the candidate would have reached at least the standard expected of candidates who are awarded Honours of the second class may recommend the award of an unclassified Honours degree. If in their opinion the candidate would not have reached that standard they may recommend the award of an Ordinary degree. The consent of a candidate to the award shall be required for the award of such an unclassified Honours or Ordinary degree on the first occasion only on which it is recommended. If such an award is refused on this occasion the candidate will be deemed not to have taken the examination. 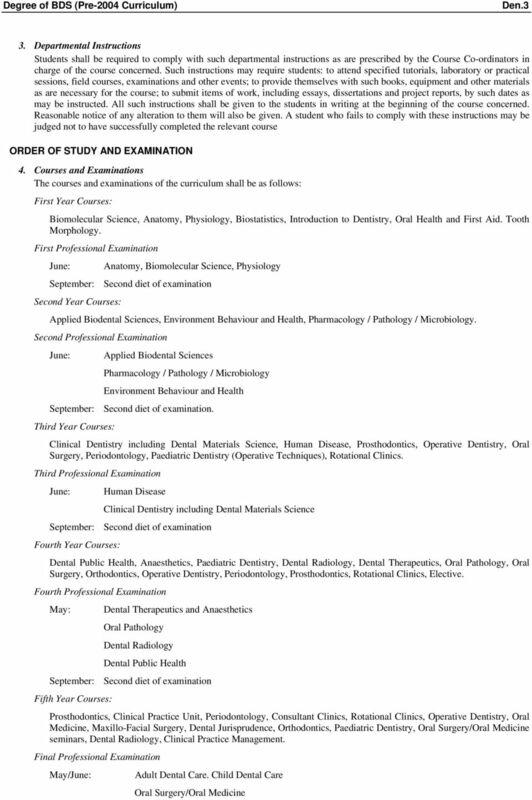 BACHELOR OF DENTAL SURGERY ORDER OF STUDY AND EXAMINATIONS Please refer to course handbook. 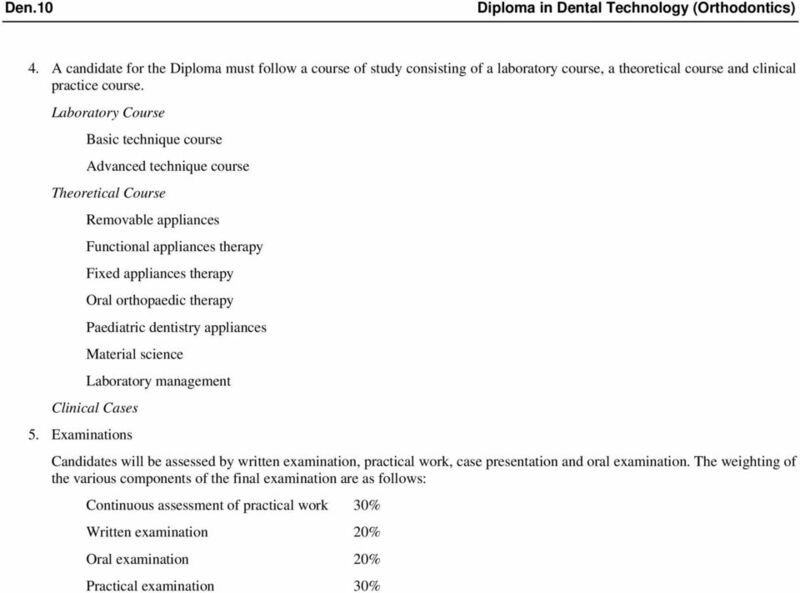 VI DIPLOMA IN DENTAL TECHNOLOGY (ORTHODONTICS) 1. The Diploma in Dental Technology (Orthodontics) may be conferred by the University of Glasgow in the Faculty of Medicine. 2. A candidate for the Diploma will normally hold one of the following qualifications: BETEC or higher qualification City & Guilds Dental Technicians Certificate Equivalent qualifications to the above recognised by the Dental School. 3. The minimum period of study will be one year of full time study or two years of part time study.